As a cake maker, my usual reading list extends to the vast array of recipe books that I’ve amassed over the years and with the wonderful tool that is the internet, any other reading that I do as a time limited business mum tends to be blogs, read from a device in the palm of my hand while waiting for a cake to bake or a child to wake up from a nap. Until now that is, and the release of this fabulous book by super blogger Vicki Psarias, founder of Honest Mum (www.honestmum.com), who incidentally is one of my favourite bloggers and a massive inspiration of mine. Vicki writes from the heart and as the epitome of the term Mumboss, gives a true and honest insight into how you can juggle family life and build your own business empire. The book is full of useful advice and tips on how to build and grow your business, right from home so you can have the best of both worlds, you can change those nappies, work around naptime, be there for school pick up and earn money all at the same time. The book resonates so strongly with me as this is exactly what I’ve been doing ever since I started my business, it’s hard work but this book coupled with Vicki’s immense success just goes to prove that being a Mumboss isn’t just a pie in the sky idealistic notion, but that with hard work and passion, it’s perfectly achievable. This book is perfect for all parents, those who aspire to become a Mumboss and those who, like me, are already living and loving the Mumboss way of life. If you’re not lucky enough to win this signed copy for yourself, you can bag yourself a copy of the book right here at Amazon! You won’t regret it and if you’re anything like me, you honestly won’t be able to put it down. When a wedding invitation lands on our doormat among the usual pile of junk mail and bills, I get a real sense of excitement. I love seeing the effort and thought that has gone into the simplest of details and that for me starts with the invitations. I absolutely love being a guest at a wedding. We were lucky enough this year to attend the wedding of some of our very good friends. I loved seeing the nervous look of anticipation on the grooms face as he anxiously waited for his bride to arrive. I loved seeing the bridesmaids walk up the aisle, proud to have such a honourary position and be there for their nearest and dearest on the most important day of their lives. I loved seeing the bride for the first time, beautiful in her gown and beaming from ear to ear, as she floated up the aisle. One of the best parts of this moment was glancing back at the groom and seeing his face as he saw his bride for the very first time. I loved watching the vows and remembering my own vows, remembering my own wedding day and how I felt to be the bride on that glorious day. I loved how when the bride and groom walked back down the aisle together as husband and wife, you could see the relief on their faces, knowing they could now start to relax and look forward to that cold glass of bubbly, or beer, in their hands. As a cake maker, I meet many happy couples planning their special day. The wedding cake process starts with a consultation, and freshly baked cake samples of course, which I always get excited about as I can just feel the excitement emanating from the couple when talking about their plans for the day. From chatting and getting to know each couple during these consultations, I get a real feel for the style of cake they are looking for. 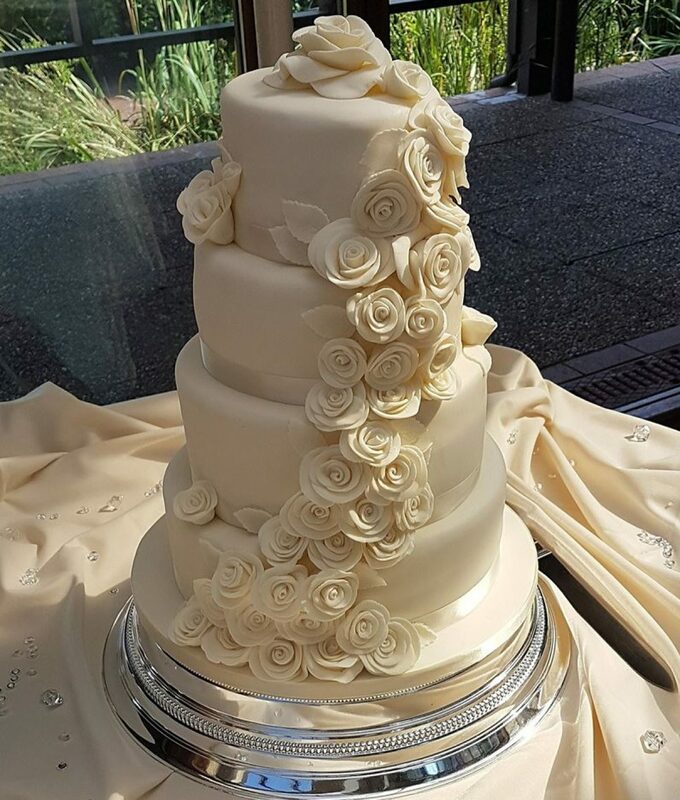 I always work with the couple to design the cake, incorporating their ideas and coming up with the perfect design. 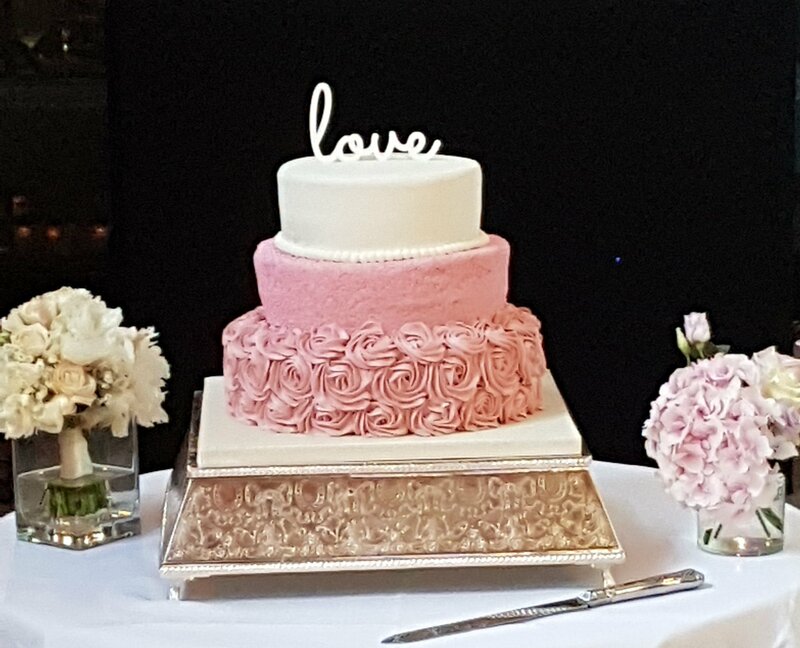 Each person, each couple is completely unique and so it makes perfect sense that each wedding and therefore, each wedding cake, should also be. On the day of my clients’ wedding, I arrive at their venue early to set up their dream wedding cake. There is often a lot of hustle and bustle going on, the venue is being decorated, the tables are being set, and sometimes I get to see some members of the bridal party, checking on the progress in the venue, or even a glimpse of some super excited bridesmaids or page boys running around the gardens. I can always feel the excitement brewing while I’m there stacking the cakes and adding he finishing touches. This is one of my favourite moments of my work, the cake is set, the venue is looking stunning and I just feel so excited for my clients, knowing that they are about to have the most perfect day of their lives. It’s very rare (unless of course I’m making the wedding cake for friends and family and am a guest at the wedding!) for me to see another glimpse of the wedding cake, or any other part of the wedding day. I frequently receive thank you messages or notes, which I keep as I treasure them all, and occasionally I receive a picture of the cake being cut, which is so lovely to see. Tara & Ben: Wedding Film at The Coppid Beech Hotel, Bracknell from Portray Wedding Films on Vimeo. 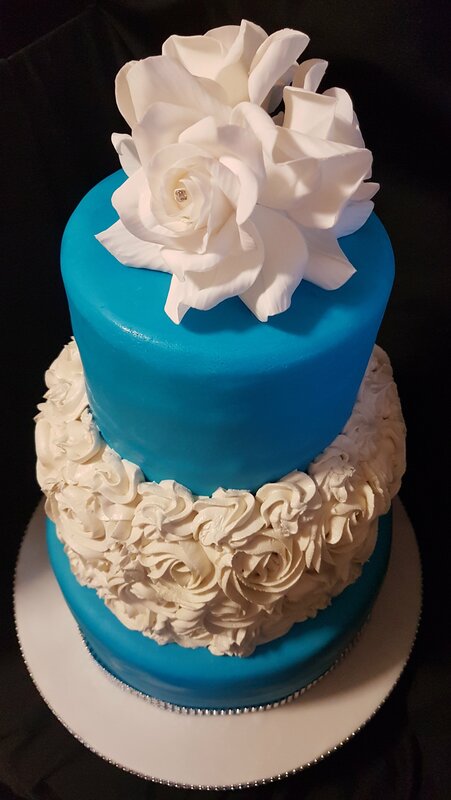 The typical wedding season may be over for the year, but I still have some beautiful winter wedding cakes to create, and more happy couples to meet for their consultations. Wedding fever continues for me all year round, and I really wouldn’t have it any other way. Christmas Pudding Recipe – It is Stir Up Sunday after all! The traditional day for baking your Christmas goodies to give them time to mature into their delicious, best, festive versions of themselves is upon us – It’s Stir Up Sunday! 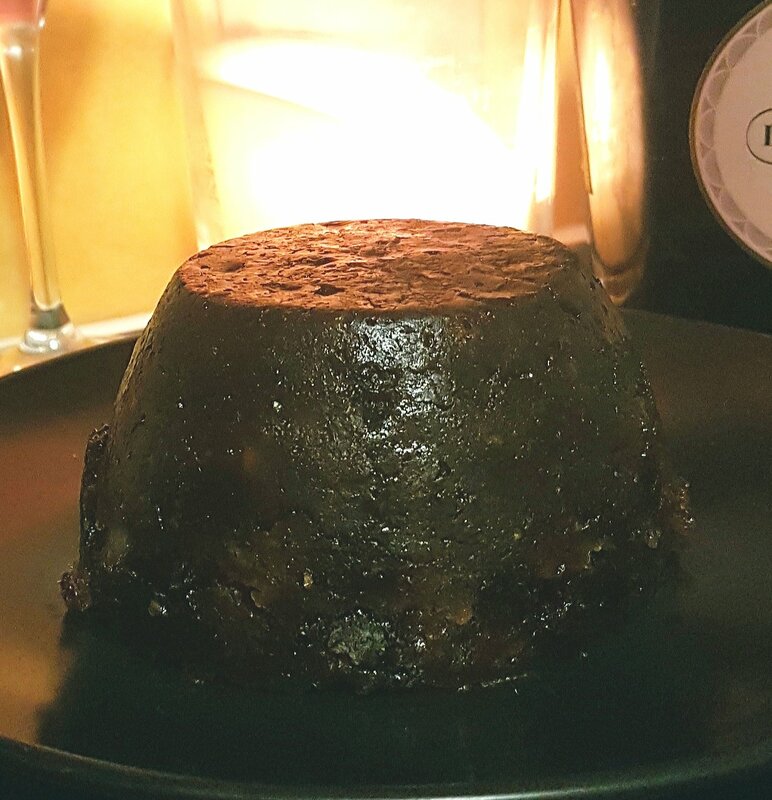 If you fancy joining in with the fun and having a go at making your own Christmas Pudding, here’s my failsafe, trusty old recipe that I’ve used for many years. It always gets rave reviews! Grease a 2 pint/1 litre pudding basin with butter and line with baking paper. Using an electric mixer, beat the butter and sugar until soft and fully combined. Add the flour, spices and eggs and beat again until mixed. Mix in the remaining ingredients by hand using a wooden spoon, until the mixture has a soft dropping consistency. Transfer the mixture into the prepared pudding basin and level the top with a spoon. Cut a disc of baking paper to fit the top of the pudding, grease one side of the disc with butter and put in place on top of the mixture (butter side down). Take a large rectangular sheet of baking paper. Fold a pleat of 1″-2″ across the middle of the sheet and place over the top of the pudding basin. Using a piece of string, tie the baking paper around the pudding basin so that the whole top of the basin is covered and the paper is securely in place. Trim any excess baking paper, but make sure you leave 1″-2″ below the string. Take a sheet of kitchen foil and fold a 1″-2″ pleat across the centre. Place over the top of the covered pudding basin and tuck it in underneath the baking paper frill below the string. Tie two pieces of string – as you would tie a parcel – crisscrossed underneath the centre of the pudding basin and tied in the middle at the top to create a handle. The lengthy part is still to come: your Christmas Pudding needs to steam for 6 hours! If you have an electric steamer you can use this, but be sure to keep checking the water levels and top it up if needs be. If you don’t have an electric steamer, don’t despair! Place your Christmas Pudding in a large saucepan with a lid. Pour boiling water into the pan until it comes halfway up the sides of the pudding basin. With the lid in place, steam your Christmas Pudding for 6 hours, checking the water level frequently and topping up with boiling water as necessary. You need to aim to keep the water level halfway up the sides of the pudding basin. Once your Christmas Pudding has been steamed for 6 hours, remove it from the pan using the string handle (very carefully!) and leave to cool completely. When your Christmas Pudding is completely cool, remove the foil and baking paper. Replace the baking paper and kitchen foil (just as you did before) with fresh pieces and tie again with fresh pieces of string, ready for re-heating. Store your Christmas Pudding in a cool, dry area (not the fridge) until you’re ready to reheat it on Christmas Day! When you are ready to eat your Christmas Pudding, you will need to steam it again for 2 hours to reheat it, following the same method as above. Author theberkshirebakesmithPosted on November 26, 2017 November 25, 2017 Categories Recipes, UncategorizedTags bespoke cake, blogger, cake artist, cake blog, cake maker, cake recipe, christmas, christmaspudding, christmaspuddingrecipe, christmasrecipe, food blog, muminbusiness, new blog, selfemployed, stirupsunday, stirupsunday2017, workfromhomeLeave a comment on Christmas Pudding Recipe – It is Stir Up Sunday after all! Cakes that meet dietary requirements are extremely important, whatever the reason behind a client requiring a specific dietary need to be met, I always take the request extremely seriously. In a kitchen that is full of wheat, gluten, eggs, milk and nuts, the utmost of care is required to prepare these cakes. The ingredients to create these recipes are stored separately, all of my equipment is always scrupulously cleaned, separate tools are used to prepare cakes without these ingredients to limit the risk of cross contamination, but even with the highest level of precaution, the risk is always there. Some of the same equipment has to be used for all cakes: the oven, for example. I always inform my clients that there is no guarantee that I have eliminated all risks of cross contamination, but every precaution is always taken. When it comes to allergies, I totally get it. I too am an allergy sufferer. This will sound utterly ridiculous given my chosen career path, but I am allergic to raw or under-cooked egg. A baker who is allergic to egg you say? Yep, that’s me! If it is thoroughly cooked, it poses no threat whatsoever, so baked cakes I can eat without any risk to my health thank goodness, but I have been amazed at how many products I have consumed in my pre-allergy lifetime that contain raw egg. Until I developed my allergy, I never realised that ice cream, for example, could one day land me in hospital, or that enjoying a lovely gooey brownie could one day lead to a trip in an ambulance. With my allergy comes an unwavering need to protect myself, but particularly when I’m working. All precautions that can be taken have to be taken to protect myself and I apply the same level of care to all of my clients, with extra special precautions taken for those with allergies or dietary restrictions. One of the most frequently requested specialised recipes I am asked to make is a gluten free cake. Whether it’s for that special someone’s birthday or for a few gluten free cupcakes to add to a wedding cake order, I have a few fail safe recipes up my sleeve. Here I am sharing my favorite gluten free sponge cake recipe. I have spent many an hour trying to perfect the perfect gluten free cake and this is my absolute favourite by far. This recipe has been adapted from a wheat, gluten and dairy free recipe that I discovered a few years ago in a much loved recipe book entitled Cake Angels by Julia Thomas. Grease and base line two 8” round cake tins. Preheat your oven to 195°c/175°c fan/Gas 5. Using an electric mixer, beat the baking margarine and caster sugar together until it forms a creamy mixture. Add the eggs and vanilla extract and beat again, scraping the mixture from the sides of the bowl using a spatula halfway through, and beat using the electric mixer until everything is well combined. Fold in the flour, xanthan gum and baking powder using a metal spoon, making sure that everything is mixed. It is best not to use an electric mixer for this part as you run the risk of knocking the air out of the mixture which may cause your cakes not to rise. Divide the mixture between the two prepared tins, using your spoon or spatula to smooth the mixture out. Bake in the centre of your preheated oven for 20-25 minutes until the cakes spring back when lightly touched, or when a metal skewer inserted into your cakes comes out clean. Allow the cakes to cool in their tins for 10-15 minutes before turning out onto a cooling rack to cool completely. Beat the butter and icing sugar in an electric mixer until the mixture starts to come together. Beat slowly at first otherwise you and your kitchen will be covered in a cloud of icing sugar dust! Add the milk and vanilla extract and beat on high speed for 5 minutes until the mixture is smooth and creamy. 5 minutes might seem like a long time, but trust me, the creaminess of the buttercream is worth the wait! 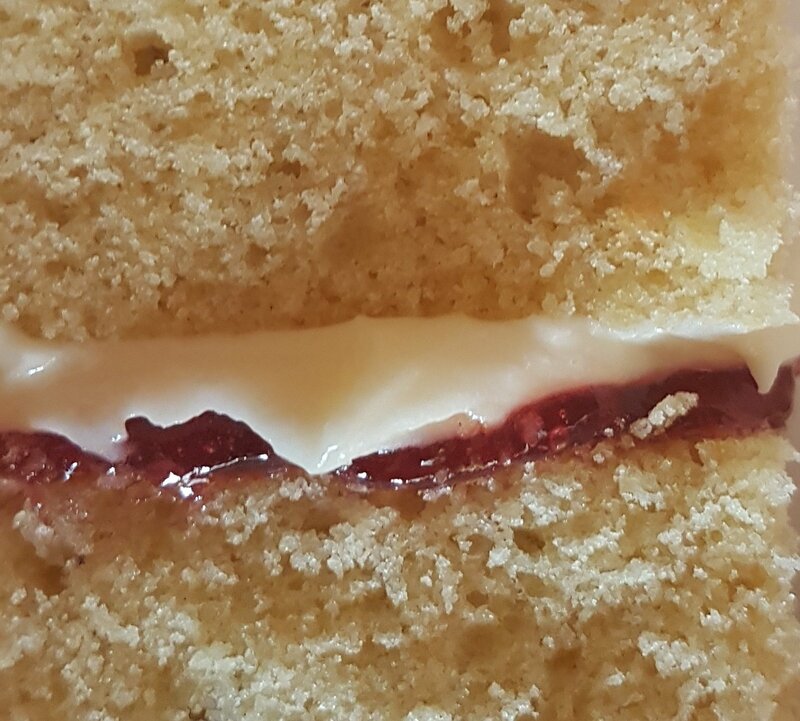 Spread a generous layer of jam onto one of your cooled cakes and the buttercream, onto the other cake and sandwich together. Your delicious gluten free vanilla sponge cake is now ready to decorate as you please, or just enjoy as it is! We all have a go to recipe, you know the one I mean, you’ve made it so many times you could probably (but please don’t!) make it with your eyes closed. This recipe is exactly that for me. This is one of those recipes that I have been making for so many years that I no longer have the faintest idea who taught me it. It’s my go to recipe when I fancy a quick and easy cake or for when I need a last minute dessert and being a cake maker, there is rarely a shortage of any of these ingredients in our kitchen. Whilst this cake is completely delicious as it is, a classic Victoria Sandwich cake, perfectly suited to enjoying with a big cup of coffee or as an after lunch treat, it’s a really good recipe that can be tweaked with a variety of fillings and suddenly, you have the perfect dessert. If, like me, you love any kind of gateau, try substituting the buttercream and jam filling for freshly whipped double cream and sliced strawberries. If you want to impress your guests, whip up some extra cream and pipe it around the top edge of the cake and dot some strawberries around before giving it a sprinkling of icing sugar across the top. Hugely calorific, but I assure you that every mouthful is totally worthy of the calorie intake. Preheat your oven to 180°c – Gas 4 – Grease and base line two 7″ round sandwich tins. Tip – To grease your tin, brush some melted butter around the inside base and sides of your tin. To base line your tin, cut a circle of baking paper and lay it on the greased inside base of your tin. Using an electric mixer, beat the butter and caster sugar together until light and fluffy. Add the eggs and vanilla and beat again until well combined. Add the flour and beat well. Scrape any unmixed ingredients from the side of the bowl using a spatula and mix again until everything is fully combined. Divide your cake mixture between the two tins, levelling it off using your spatula. Bake in the centre of your preheated oven for around 20-25 minutes. Once fully cooked, leave your cakes to cool in the tin for 5-10 minutes before turning them out onto a cooling rack. Tip: The sponge cakes will be cooked when they spring back when lightly touched and when a skewer inserted through the top of the cake comes out clean! Using an electric mixer, beat the icing sugar and butter together until combined – Beat slowly at first or you and your kitchen will be covered from head to toe in icing sugar wafting out from the bowl. Gradually increase the speed as the mixture comes together. Add the milk and vanilla extract, beat slowly until the milk has combined and then turn the mixer up to full speed and beat for a few minutes until the buttercream is light and creamy. Once your sponge cakes are completely cool, spread (or pipe if you’re feeling fancy) your buttercream evenly onto one of the sponges. Spoon a good amount of jam onto the other sponge and spread using a spoon. Using a small sieve, icing sugar dusting tin or even a tea strainer, give the top of your cake a light dusting of icing sugar. Tip: Dont forget to store any uneaten cake in an airtight container. If you have swapped your filling to one containing fresh cream or fresh fruit, make sure you cover and refrigerate your cake. I love to see pictures of your creations inspired by my recipes, please feel free to share your pics of your bakes! Cake making, it’s not a proper job, is it? This response isn’t unique to one person when discussing what I do for a living, there seems to be a bit of a misconception that if you’re a mum and you run your own creative or craft related business from home, you must be just doing it for a bit of extra cash, for fun money for the family or for the newest must have bag that’s just hit the shelves. I know that in some cases that this will be the reason behind some business ventures and why on earth not? If you’re particularly good at something artistic and crafty and people want to buy your wares, then why not make some extra money doing something you love? It makes perfect sense. Many years ago, I was scouring the jobs market for something suitable that would work well around my family and yes, granted, I could have taken a job doing something I didn’t particularly enjoy, but I didn’t much fancy the idea of paying out a massive chunk of my hard-earned cash on childcare. It was at this point that I decided to really push Fairybake, the name of my cake making business at the time, which had until this point actually been a bit of a hobby to make some extra cash for treats for my son, and manicures and cocktails for me on my rare nights to myself. With a lot of blood, sweat and tears, lots of leaflet dropping, marketing and rallying my friends and family to share my business with their friends, on social media and in real life, I started to get a lot of custom in my local area on the Kent coast. It still wasn’t quite enough though, so I had the brain wave of approaching local cafes to make cakes for them to sell to their customers. I secured an excellent contract with a local coffee shop and I was soon baking and delivering several cakes for them a few times a week, as well as creating my bespoke wedding and celebration cakes. Now, don’t get me wrong, this was a very long way from being easy, but what it meant was that I could work during school hours. From 9am until 3pm every day I could be found in my kitchen and then I was straight back to it again after my son went to bed, more often than not working into the early hours of the morning. Since then, we have relocated to Berkshire, re-named and re-branded my business completely and there are now two gorgeous boys gracing our family. With the youngest being a toddler, I make the most of every second I have available, including evenings and some of the weekend too when the need arises. The beauty of being self-employed for me is being able to pick up and put down work whenever I need to. As long as my order dates and bookings are met and my work is exceptional, it doesn’t matter too much what time I am working, be it 12pm or 12am. Running a cake making business isn’t just about the baking and making things look pretty and fancy. Like all businesses, there’s an awful lot that you don’t see, and these things all take valuable time. The baking, designing, the artistic cake decorating and modelling, meeting clients for design consultations, blogging, setting up wedding cakes, running children’s cupcake decorating parties, seeing little faces light up when they see their birthday cakes for the first time, are all the fun and totally rewarding parts of my work, they are the real passion driving the force behind my business. The other stuff, sourcing best insurance policies and suppliers, stock management, the admin side of things, creating contracts, website designing, advertising, branding, social media management, pricing and of course, the dreaded accounts all still need to be done. As a small business, it makes no sense to outsource these things financially, and there is only one person this can all fall on. Me. I am essentially a whole team of people working from one body and mind. Like most jobs, it’s hard work, it’s exhausting, it’s challenging, but it’s also extremely rewarding, fits perfectly around my family and it means that I get to do something that I absolutely love for a living. I am blessed to have turned my passion and my hobby into a proper job that does in fact pay the bills. I have built a brand that I am exceptionally proud of. Plus, I have nobody to answer to except myself, which in my mind is utter perfection. Author theberkshirebakesmithPosted on October 11, 2017 October 11, 2017 Categories Being a Business Mum, UncategorizedTags bespoke cake, birthday cake, blogger, cake artist, cake blog, cake maker, food blog, mumboss, muminbusiness, new blog, selfemployed, wahm, wedding cake, workfromhome4 Comments on Cake making, it’s not a proper job, is it? The leaves are falling, the winter boots, hats and scarves are being hunted out of their hiding places, and the heating is back on, which can only mean one thing. Autumn is most definitely here. Now, I’m a massive summertime fan, I love the sun, I love my flip flops and I love the smell of sun cream, so I’m one of those people who complains when the weather starts to turn chilly. But, even I will admit, there is something I find very comforting about wrapping up in a fluffy warm hat and scarf and venturing out on leafy walks with my boys looking for conkers. Once I step back through my front door into the warmth, the first thing I always yearn for, is a mug of hot chocolate and if I’m feeling extra naughty, a dollop of whipped cream on top and some marshmallows. These particular cupcakes were inspired purely by this, as the weather must turn each year, they are the perfect antidote to suddenly freezing on the school run and realising it’s time for your flip flops to go back into hibernation. The cupcakes are super simple to make and I guarantee you won’t have these cupcakes lurking around on your kitchen side for very long. The recipe was adapted from a chocolate cupcake recipe I found, and fell in love with, a few years back in The Hummingbird Bakery Cookbook. Tip: The cupcakes will be cooked when they spring back when lightly touched and when a skewer inserted through the top of the cake comes out clean! Pop a few mini marshmallows on the top and voila…your Hot Chocolate Cupcakes are ready to eat! Tip: In the unlikely event that all 12 of these cupcakes don’t get immediately eaten, store them in an airtight container. The Berkshire Bakesmith's Blog Powered by WordPress.com.